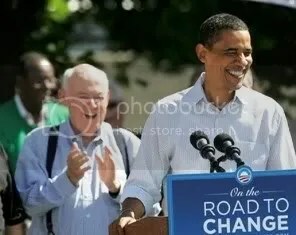 Obama said Biden would be leading the job-training effort along with other administration officials. "We need to rethink how we move folks into these new opportunities," Biden said. Obama and Biden earlier toured CCAC’s Mechanatronics workshop, where instructors and students showed them stations for mechanical drive, motor control and traffic-light control systems. "I have to say before I came here I didn’t know there was such a thing as mechanatronics," Obama said. "It sounds like something Godzilla would be fighting. Turns out it’s about engineering." He noted CCAC’s programs were among those that he had in mind for the job training. "We want to replicate your model across the country," Obama said. "You’re doing something right that is making a difference in people’s lives and we want to spread the word. That’s why we’re here today in Allegheny County." The apprenticeship program would be an expansion of existing programs that would reach into advanced manufacturing, the automotive industry, information technology, building trades and health care, according to information on the White House website. Some big-name companies already are on board, including Alcoa Inc. (NYSE: AA), Ford, General Motors, Chrysler and United Parcel Service. The United Auto Workers, Service Employees International Union and North America’s Building Trades Unions are also involved. "We want to work with national industry associations to help partnerships like this take root across the country," Obama said. The president also mentioned several local companies, including Alle-Kiski Industries in Leechburg, Aerotech Inc. in O’Hara Township, and Schroeder Industries in Leetsdale. 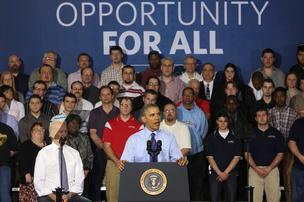 New Century Careers, the South Side-based job-training organization, drew a cheer when Obama mentioned it.